One of the best tools you can have at your disposal in the kitchen is a good knife. Once you start doing more of your cooking from scratch and work at finding ways to Make Your Own stuff, you’ll find yourself doing more slicing and dicing and chopping. I have a favorite chef’s knife that I got for Christmas a few years ago that I love, BUT – I’m a little embarrassed to admit that I wasn’t doing a very good job of taking care of it. Little rust spots were popping up here, there, and everywhere on my knife. I’m pretty sure it was because it would set in my dishwasher after a cycle and not be completely dry. Whatever the reason, more and more little rust spots were appearing and I was living in denial and pretending they weren’t there because I didn’t really know what to do about it. But after just so long I couldn’t really ignore the problem anymore. It was time to see what could be done, and to see if there was a good DIY solution to get rid of rust spots on a knife. I read somewhere that you could clean a rust spot off a knife with a piece of crumpled tin foil. I decided it was worth a shot and wadded up some tin foil and started rubbing. Almost as soon as I started, I didn’t like what I was doing. 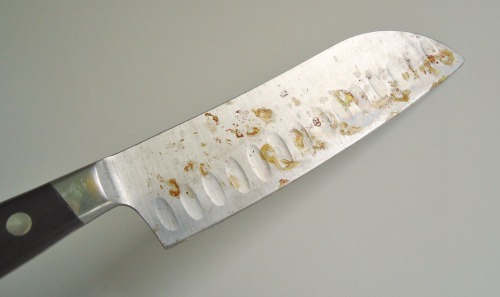 The rust spots weren’t coming off and I felt like I was scratching the dickens out of my knife and ruining the finish. I stopped and moved on to the next attempt. 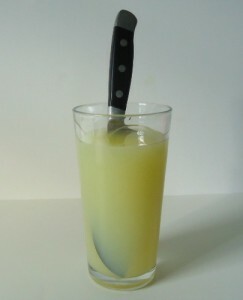 Pinterest told me that if I soaked my knife in lemon juice I could get rid of the rust spots. Sooooo . . . I filled a glass with some lemon juice, plopped my knife in it, and waited about 15 minutes. Nothing. I let it soak a little longer and tried scrubbing it some more, and then soaking some more. Still nothing. Oh well. Time to move on to attempt #3. OK, this isn’t really a DIY solution, but it was the solution that worked. I resorted to one of my three store bought cleaners that I can’t give up. I got out the Bar Keepers Friend. This scouring powder totally did the trick and in fact worked so quickly that the rust spots were gone after only a few seconds of rubbing. Amazing. So there you have it. As much as I enjoy finding homemade remedies, this was one of those times where the store bought item sure seemed to provide a better solution. If you too have a favorite knife with some rust spots that you want cleaned away, I would recommend giving it a scrub with Bar Keepers Friend As you can see in the before and after picture below, you’ll be rewarded with a shiny clean knife that looks almost as good as new again. Thank you soooo much!! I too am embarrassed by not taking care of a good chef knife, that I love dearly. I use Barkeeper’s friend on so many other things I never thought of using it on my knives. Finally I can use my knives with pride again! Bar Keepers is Wonderful…I have an antique brass fireplace fender…it looked tarnished & awful, I tried a brass cleaner, with Very Poor Results…after trying several other cleaners, I decided, “What the Heck” & tried Bar Keepers…VOILA it looks Beautiful. I decided the grime was just atmospheric grime that had accumulated over the years & what the piece needed wasn’t polishing but a Good Cleaning! Since I’ve tried Bar Keeper on other Brass things & they’ve come out Gleaming! Thank you so much. I was ready to replace my knives, but something told me to go on Pinterest. Luckily I have some bar keepers friend. I used it on my knives and the rust is gone! I searched for a way to get rid of rust on a knife exactly like yours and liked the idea that you gave a list of tips you had tried so I tried the Barkeepers Friend and the rust came off with a little scrubbing. I scrubbed with one of the sponges that are encased in nylon net. I’m glad you were able to get those rust spots off Karen! I’ve found that BarKeepers Friend almost always gives good results. Thanks for this! I actually keep Bar Keeper’s Friend to clean my stainless steel sinks. I don’t know why I didn’t think I could clean the rust off of my beautiful knives my son bought me for Christmas! I will quit putting them in the dishwasher too! Did it scratch the metal? I have a decorative damask knife and I am afraid to use anything but baking soda on it. My own experience has been that Barkeepers Friend did not scratch my knife and has never scratched my sink, or pans, or tub, or any other place I have used it. I read all three solutions- jumped up and got the Bar Keepers Friend, and now my knife has no more rust spots! Yayy #3! use a Brillo pad…works just as well, easier and not as messy. SOS pad works just fine. I use a pumice stone. Works great and chemical free. It will do the same thing. My mom swears by BCF though. sad to say I have a favorite pan I have boiled dry 3 times. Sad, I know. Bar keep saved it every time. Now if I could get it to freshen the air and get rid of the stinky food! I fell several years ago and lost my sense of smell (yes I can still taste) and it makes cooking harder. So, Beverly, several people on FB think your before/after are two different knives, because of the lighting and angle making them look slightly different. It would be great if you could go on the Hometalk page and clear this up. It’s obviously the same knife. Oh my goodness, I went over there and assured everyone that it’s the same knife. I would never lie to you guys or put fake pictures here. 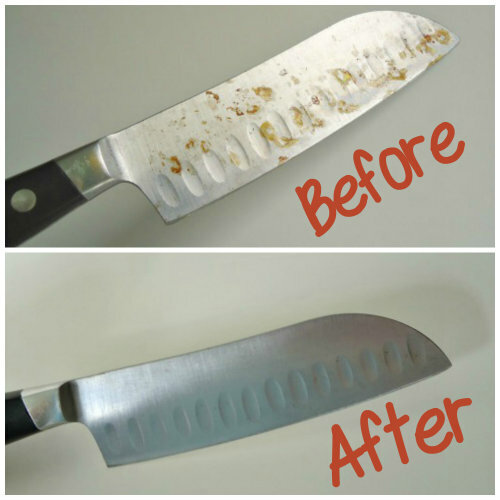 The Bar Keepers Friend got rid of the rust spots and it’s the same knife in the before and after pictures. That’s the truth. Thank you off your commentary on fb. The naysayers are still going at it, unfortunately. I can only laugh! You might also try white vinegar. Soak it. Also very very good for soaking rust on hand tools that get left out in the rain. Baking soda works well for this as well. Make a little plop of paste with some water and rub on the rust spots. Voila! If the knife is high carbon stainless steel it should only be hand washed and dried immediately to prevent those rust spots. Leaving them soaking in the sink or putting them through the washer will do it every time, I’m learning the hard way! But a good knife really is worth a little extra work! What a great cleaning tip, I have a couple of knives to try this on. Thank you for sharing! You have to be careful with this product. It is poisonous and can be a so ed through the skin. It is made of Oxalic acid. I would just do some research to make sure you are using it safely. I have heard wonderful things about how well it works but it need to be handled with care. Wonder if this will work on pans? I first learned about Bar Keepers Friend from my Dad who was using it to shine up his pans! They were so shiny when he was done I had to ask him what he was using and then went out and bought some for myself. So I have seen Bar Keepers Friend used on pans and they looked great afterward (although it was not a case of trying to get out any particular spots or rust). Thanks for the tip! Although the crumpled tin foil didn’t work on your knife, it will do a great job on restoring the surface of chrome. I used it on parts of my car and it did wonders! Barkeepers Friend can be used to clean sinks, tubs, your white leather, sandals, just about anything. We used only this product on our white leather marching boots for drill team. It works and is gentle enough not to harm leather or fabrics. It can handle any job with ease. Cleans the back splash of the stove easily and does not scratch surfaces. It is essential to the household! Thanks for this info! I wonder if bar keepers friend would also work to clean up the drip pans on my stove? I tried using baking soda on the drip pans as I read before and it only helps slightly. I think it would work on the drip pans and would certainly be worth a try. I’ve used Bar Keepers Friend on pots and pans and it makes them really shiny. What a great post! I enjoy reading about tips like this and I am sure everyone else does too. Thank you for linking this to the In and Out of the Kitchen Link party. See you next week. Will have to see where I can get some from I think. Just a quick note though, my daughter did a knife handling course while studying & working in a commercial kitchen. I remember her saying never, never, ever put your chef knives in a dishwasher – apart from the rust potential from staying damp it’s apparently very bad for the blades..
I’m sure that’s true that the dishwasher is hard on your knives. I should stop being lazy and be sure to hand wash my knives instead. Bar keepers Friend can be purchased at Wal Mart. I love it myself! LOL. Alton Brown did a show once and demonstrated how to wash your good knives. It seemed a little “over-kill” to me, but the point was to hand wash them. It’s better for them. I worked in a flower shop once and we had to use bleach cleaner spray at the end of every day because the natural chlorophyll in the stems would stain the scissors and knives. It has been something I do from time-to-time with my good knives now so I don’t have to scrub or scour them. The bleach dissipates and even though stainless steel is reliably strong, it’s still porous, so just let them air dry to kill rust and let the bleach fully dissipate.